From February 14th until the 20th TRICKSTER is residing in UBIK for a pre-research. They conclude this pre-research with a ‘spectral’ presentation on February 18th: a sort of pre-image of the final opera in 2018. 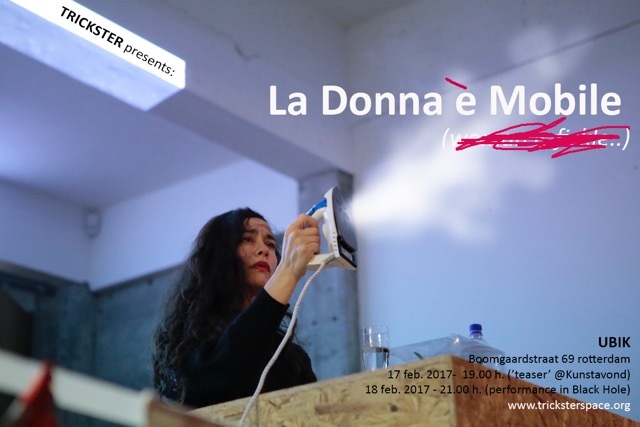 On February 17th they will perform a small teaser in the Performance Bar during the Kunstavond in het Witte de Withkwartier. The TRICKSTER collective consists of five women with different artistic backgrounds: Barbara Ellison (sound artist), Nina Boas (perfomance artist), Nathalie Smoor (actress/dancer), Ieke Trinks (performance artist) and Mariëlle Verdijk (scenographer). The performances of TRICKSTER are based on collaboration, improvisation and various (individual) fascinations. Everyone brings images, text and sounds along in the process of concocting a performance. Although some of these ingredients might have little connection at first, eventually they gravitate towards each other and connect in an intuitive way. In this method of production there is no acute need for consensus. Instead, a common vocabulary is developed through the unconditional acceptance of each other’s propositions and ideas. TRICKSTER thus formalizes the accidental and emphasizes the conscious process of emergent collaborative composition that’s behind the seemingly random acts. Five individual thought processes – which are sometimes highly private and subjective – are turned into a coherent assemblage.